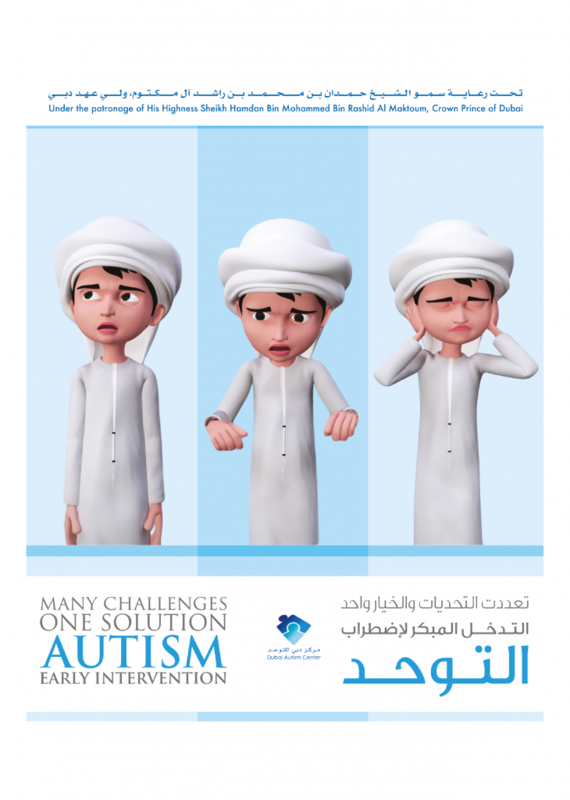 Under the patronage of His Highness Sheikh Hamdan Bin Mohammed Bin Rashid Al Maktoum, Crown Prince of Dubai, the annual autism awareness campaign of the Dubai Autism Center will be launched on the 2nd of April – the World Autism Awareness Day – to last through the rest of the month. The campaign includes a number of awareness presentations in schools, hospitals and public departments aimed at increasing public awareness and promoting a better understanding about the various challenges of autism and how early intervention is important for individuals with autism. Mohammed Al Emadi, Director General of Dubai Autism Center said: “Each year, the campaign tackles a different issue to highlight autism. This year, the campaign focuses on the fact that effective early intervention programs are an important first step for children,” “The priority this year is to strengthening the outreach programs to help raise more awareness about Autism. There are a series of visits planned to government and private institutions to raise awareness about autism amongst the public during the campaign,” Al Emadi said. “Early intervention for young children with autism creates the most favorable outcomes. While in the past, doctors often took a wait-and-see attitude, today most experts suggest taking action as early as possible to help children with signs of autism,” he added. Al Emadi also explained that the ideal age for early intervention begins at the age of two and extends up to five years, where the children at this range of age have better cognition and ability to learn different skills which would help children integrate into the community effectively compared with children who haven’t had the opportunity of early intervention before six years. Al Emadi thanked the partners and sponsors of the campaign to support the DAC’s efforts in the field and media, especially the Emirates National Oil Company (ENOC) for its continued support during all years’ campaigns. Acknowledging ENOC’s quick response and willingness to run the campaign’s awareness TV commercials on all its stores’ screens in addition to distributing the leaflets within the stations of “ENOC and EPPCO” by its team members who wear the campaign t-shirts in 24 stations in Dubai, Ajman, Umm Al Quwain, Ras Al Khaimah and Fujairah during April. Al-Emadi also thanked UNION COOP for taking a key role in supporting the campaign, directing the assistant staff to wear the campaign’s t-shirts in 15 of its branches, as well as promoting the message of the campaign “Many Challenges, One Solution.. Autism Early Intervention” on all their shopping bags during April. He also thanked Canon Middle East for sponsoring the campaign as an active partner in supporting the Center’s outreach efforts, praising its continued support over the years and its humanitarian commitment to support autism issues. Also thanks extended to Al Rawabi Dairy and World Security for taking an effective part in this campaign and being outstanding advocates for children with autism. Al Emadi praised Zee Entertainment Middle East and Reel Cinema – the campaign’s media partners – for their outstanding role they play in creating public awareness as the campaign TVC will be running across the Zee channels and Reel Cinemas throughout the month of April. Dubai Autism Center is a non-profit organization launched in 2001 with the main objective is to successfully integrate children with autism into the community with focused efforts to create social awareness about Autism. The Centre also works toward facilitating a better community understanding of autism by launching periodical, public and targeted, awareness campaigns. The major awareness campaign is launched annually on the 2nd of April and lasts for the full month. The campaign is supported by TV, radio, outdoors, and press advertising as well as talk shows and several crowd pulling and interest generating activities. Autism is a complex neurobiological disorder that lasts throughout a person’s life; it affects the person’s verbal and non verbal communications as well as imaginative play and social skills. ASD transcends social, cultural and geographic boundaries. According to recent studies, 1 out of every 68 children is affected by ASD.